Welcome to the official website for Patricia Kokinos and her award-winning novel Angel Park--a story that reveals the complexity of “school reform” and the deep aspects of human nature that keep us bound to “tradition.” To change the schools, we must change our minds; by changing our minds, we can change the world. Join us in promoting a new vision for schools by “liking” Change The Schools on Facebook and sharing our fresh perspective with your friends. In a world that allows bureaucracy, corruption, and self-serving agendas to stifle growth and equality, how can we rescue our collective future? Angel Park, a literary mystery about the death of a school official, exposes the underbelly of the American Dream and reveals the deep beliefs we may have to uproot to make some changes that count. 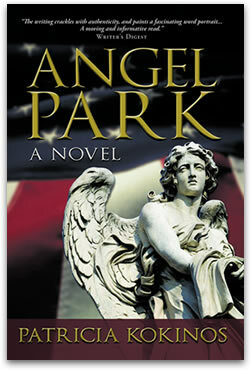 Read the opening and see awards and reviews on our Angel Park page. Buy Angel Park in trade paperback or Kindle format on Amazon. For the ePub version that suits most other e-readers, go to the publisher’s website at iUniverse. People in education used to talk about a “paradigm shift” as a way of meeting the needs of new generations of students. However, the world is moving forward so rapidly that tinkering with the current out-of-date paradigm will never be enough to help students, teachers, and the nation make the quantum leap that the future requires. 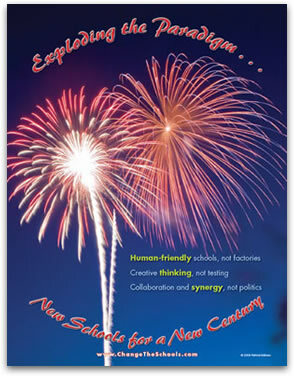 Now, it’s going to take an explosion of our current paradigm to move public education forward. Be an Advocate page. You will also find Best Sites and links to web pages where you can learn more about school change and get involved in creating the new paradigm. Patricia Kokinos has been working for school change for her entire career as a teacher, school and district administrator, and parent. With her wide range of experiences in K-12, county and state education agencies, Patti has seen the best and worst of our current system, on both sides of the country. Her innovative first novel, Angel Park, is a fictionalized but true story of the deep inner life of schools--and what it’s going to take to change them. 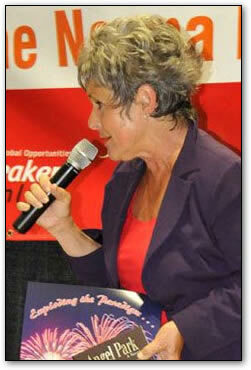 Read the saga of Patti’s journey through public education on our Author Bio page. Hear Patti talking about school change on our Media/Contact page. Find free articles to read, share, and download on our Articles/Video page. Discover a new design for schools and read about the global movement to create more intelligent schools on our New Vision page. This vision is the basis of our campaign to promote a reinvention of public education.